Virginia Classic Mustang Blog: 65-66 Mustang Windshield Washer Hose Kit-Now with Correct Ribbed Hoses! 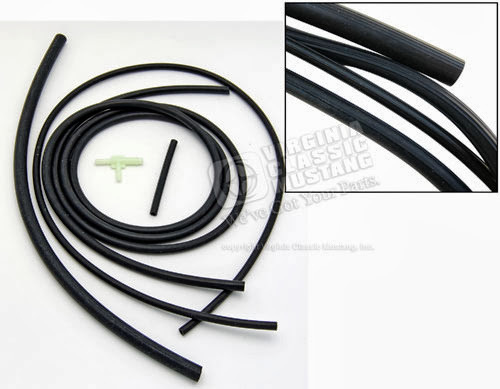 65-66 Mustang Windshield Washer Hose Kit-Now with Correct Ribbed Hoses! 1965-66 Mustang Windshield Washer Hose Kit - Now with Correct Ribbed Rubber Hoses! Our EG-300 1965 and 1966 Mustang Windshield Washer Hose Kit now comes with the correct ribbed rubber hoses. The correct plastic washer tee connector is also included. These hoses were originally ribbed like this from the factory, so it's just another nice little detail to add to a correct restoration.